Archbishop Bernardito Auza, Permanent Observer of the Holy See to the United Nations, on March 15, 2018, mentioned Pope Francis’ emphasis on the right to education for girls and boys to make it possible for them to grow as dignified agents of the own development. 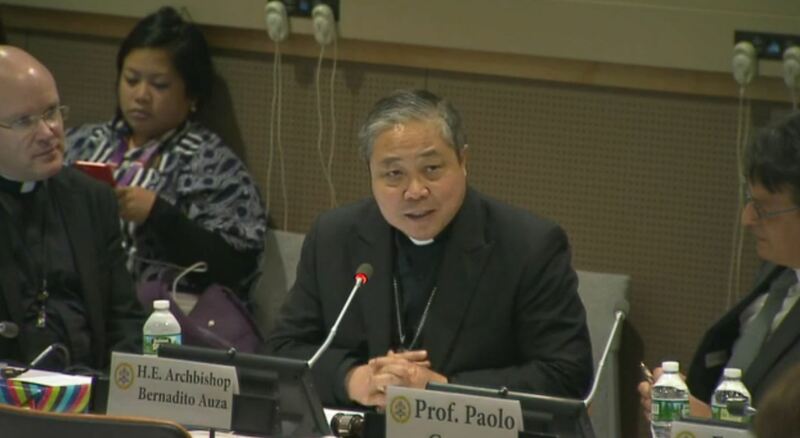 The Sustainable Development Agenda, Archbishop Auza continued, is committed to ensuring by 2030 that all girls and boys — especially the 120 million children with no schooling at all and the 130 million more in very poor quality schools — have access to free, equitable and quality primary and secondary education. He said that the Catholic Church is very proud of its Catholic school system that educates 68 million students worldwide every year and the history of educating girls and those on the margins. He added that providing access to schools is not enough; education must help make students smarter, wiser, better and more human. The Catholic Church is very proud that over the course of our 2,000-year history, we have played a major role in bringing education to children who were being totally left behind. In particular, thousands of Catholic women’s religious orders were founded with the explicit purpose and charism to educate girls at a time when none but the richest girls with private tutors received any formal education at all. Many of these religious orders sought to educate in particular girls from poor families and orphans and many of these women religious left their homes and traveled to far away countries in order to found schools in remote, rural villages where schools had never before existed. Today the Catholic Church runs 73,580 kindergarten programs educating more the 7 million children; 96,283 Catholic elementary schools educating 33.5 million girls and boys; 47,415 Catholic second schools educating 24.8 million teens, and Catholic Colleges and Universities give tertiary education and terminal degrees to 2.7 million more. It goes without saying that of these 68 million students — and more than 3o million girls — across the world, many are not Catholic or even Christian. Over the course of my time here at the United Nations and in diplomatic postings elsewhere, many Ambassadors, diplomats and UN officials who are not Christian, both women and men, have told me that they are graduates of Catholic schools and credit much of their success in life to the teachers and classes that they had in those institutions. In all of this, the schools run by the Catholic Church seek not to supplant but to assist parents, who are the first teachers of their children in the irreplaceable school called home. Providing access, however, to schools and basic education for girls no matter where they live, whether in cities or the remotes hamlets, although essential, is not enough. For girls to grow into flourishing women, much more is needed. Education is far more than instruction. As the Latin word edúcere indicates, it means leading people out of the darkness of ignorance into the light of knowledge, from immaturity to true maturity. It’s aimed not just at helping people become smarter but wiser. It involves not just imparting information but formation, assisting the young to seek the truth, come to know it and come to live in accordance with it. Its aim is not just to help them become intelligent adults but genuinely good persons. * Mrs. Mary Hasson from the Catholic Women’s Forum is here to speak about a fuller sense of the empowerment of women through education by ensuring that it corresponds to woman’s full dignity as a person in a context in which so many educational structures are geared toward teaching according to male pedagogical frameworks or according to a reductive understanding of who woman is. * Ms. Amritpal Sandhu from Education Cannot Wait is here to speak about educating girls in emergency circumstances. One of the first things that can happen in conflict situations is that the formal education of the young is put on hold or is stopped altogether. She’ll describe for us that education cannot wait and share with us best practices from her wide experience in ensuring the education of boys and girls in some of the most difficult circumstances imaginable. * Dr. Sakena Yacoobi is here to describe for us her extraordinary fight for the education of girls and women in refugee camps and in her native Afghanistan and what we can all learn from that experience. * And Dr. Timothy Rarick from BYU-Idaho is here to speak about the unique education girls receive from their fathers and how involved fathers help make stronger daughters. His talk will highlight one of the most important elements in the educational setting of the home, as dads work with moms to help their daughters and sons grow to maturity so that they might become, in turn, the teachers in domestic academies they themselves may establish afterward.